Observatories atop Mauna Kea (13,796' extinct volcano). A segment of the Keck mirror, in the aluminizing room. Don't sneeze! Lynne in Waipo canyon: rain forest on the northern coast. 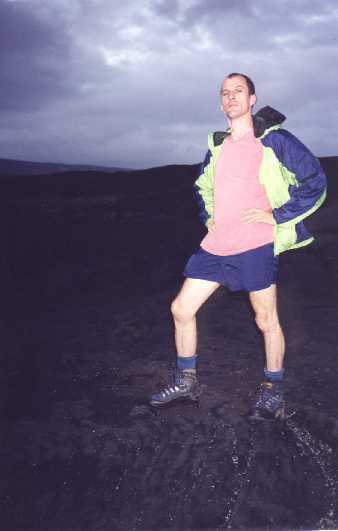 Me in the lava fields of Volcano National Park. Nice boots, hey? I bought them in response to my wet-boot debacle at Rainier. Asolo, MSRP $225, on sale for $175 at Any Mountain Outlet. Instead of eyelets or loops they have tiny brass pulleys.